LISBON, Jul 25 2014 (IPS) - Evidently, oil talked louder. By unanimous resolution, the Community of Portuguese Language Countries (CPLP) admitted Equatorial Guinea as a full member, in spite of the CPLP’s ban on dictatorial regimes and the death penalty. At the two-day summit of heads of state and government that concluded on Wednesday Jul. 23 in Dili, the capital of East Timor, Portugal was the last nation to hold out against the inclusion of the new entrant. Portuguese prime minister, conservative Pedro Passos Coelho, finally yielded to pressure from Brazil and Angola, the countries most interested in sharing in the benefits of Equatorial Guinea’s oil wealth. The CPLP is made up of Angola, Brazil, Cape Verde, East Timor, Guinea-Bissau, Mozambique, Portugal, and São Tomé and Príncipe. Between its independence in 1968 and the onset of oil exploration, Equatorial Guinea was stigmatised as a ferocious dictatorship. Gradually, the importance of oil took precedence over human rights and countries with decision-making power over the region and the world became interested in sharing in crude oil extraction. Oil production in Equatorial Guinea has multiplied 10-fold in recent years, ranking it in third place in sub-Saharan Africa behind Angola and Nigeria. “The kleptocratic oligarchy of Equatorial Guinea is becoming one of the world’s richest dynasties. The country is becoming known as the ‘Kuwait of Africa’ and the global oil majors – ExxonMobil, Total, Repsol – are moving in,” said the Lisbon weekly Visão. Visão said this former Spanish colony has a per capita GDP of 24,035 dollars, 4,000 dollars more than Portugal’s, but 78 percent of its 1.8 million people subsist on less than a dollar a day. In the view of some members of the international community, “Since 1968 there have been two Equatorial Guineas, those before and after the oil,” Ponciano Nvó, a lawyer and distinguished defender of human rights in his country, told IPS during a three-day visit to Portugal at the invitation of Amnesty International. In spite of average economic growth of 33 percent in the last decade, the enormous wealth of Equatorial Guinea has not brought better economic conditions for its people, although it has lent a certain international “legitimacy” to the regime, crowned now with the accolade of membership in the CPLP. Since Equatorial Guinea’s first application in 2006, the CPLP adopted an ambiguous stance, restricting it to associate membership and setting conditions – like the elimination of the death penalty and making Portuguese an official language – that had to be met before full membership could be considered. “Portugal should not accept within the community a regime that commits human rights violations; it would be a political mistake,” and also a mistake for the CPLP, Andrés Eso Ondo said in a declaration on Tuesday Jul. 22. He is the leader of Convergencia para la Democracia Social, the only permitted opposition party, which has one seat in parliament. The other 99 seats are held by the ruling Partido Democrático de Guinea Ecuatorial. In Portugal, reactions were indignant. The president himself, conservative Aníbal Cavaco Silva, remained wooden-faced in his seat in Dili while the other heads of state welcomed Obiang to the CPLP with a standing ovation. Meanwhile, in Lisbon, prominent politicians were heavily critical of the government’s accommodating attitude. “The dead are not only those who have been sentenced to death in a court of law, some 50 persons executed by firing squad after being convicted; we should multiply that number by 100 to reach the figure for the people who have disappeared,” and who were victims of repression, Nvó told IPS. In the 46 years since independence, “during the first government of Francisco Macías Nguema, all the opposition leaders were murdered in prison, without trial, having been accused of attempts against the president. The ‘work’ was carried out by the current president, when he was director of prisons and carried out a cleansing, before overthrowing his uncle,” he said. 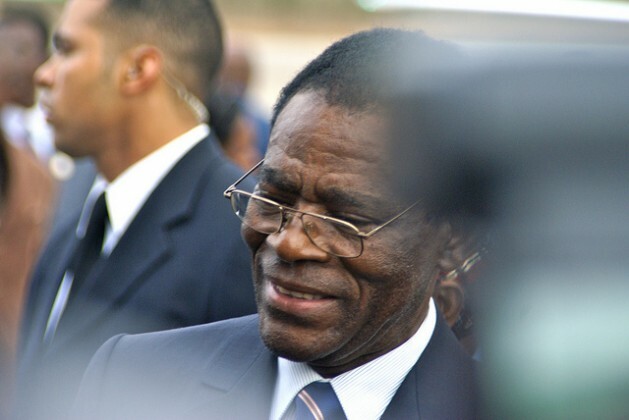 Before oil was discovered, “Obiang never thought entry to the CPLP would be possible, but in oil-rich Equatorial Guinea, all the president’s goals are possible,” he complained. Now, however, the CPLP has been satisfied with a moratorium on the death penalty, which remains on the statute books. Its enforcement depends only on the fiat of the head of state. “It’s an intellectual hoax,” Nvó said. “Joining the CPLP today is simply coming home,” he said. In a telephone interview with IPS, former president of East Timor José Ramos-Horta said, “I agree with the forceful criticisms denouncing the death penalty and serious human rights violations that are committed in that country.” In his view the denunciations of the regime made by international organisations are to be credited. In exchange for admission, Ramos-Horta recommended the CPLP should establish an agenda to force Obiang to eliminate the death penalty, torture, arbitrary detentions and forcible disappearances. It should also include, he said, improved facilities and treatment for prisoners; access to inmates by the International Red Cross; and later on, the opening of an office of the United Nations High Commissioner for Human Rights in Malabo. One of the most critical voices raised against the events in Dili was that of political sciences professor José Filipe Pinto, who asserted that a sort of “chequebook diplomacy” had prevailed there, with Malabo offering to make investments in CPLP countries, relying on its resource wealth.